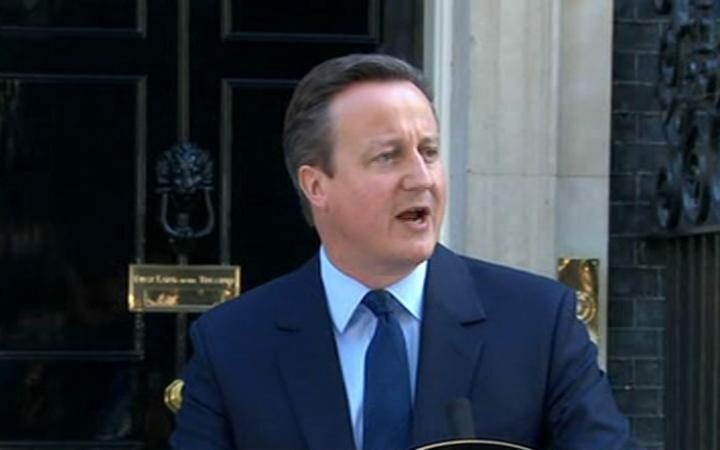 Prime Minister David Cameron has announced his resignation following Britain's vote to leave the European Union. In a speech, he explained he would step down by October to ensure the country has a "strong, determined and committed leadership". We not only have a parliamentary democracy, but on questions about the arrangements for how we've governed there are times when it is right to ask the people themselves and that is what we have done. "There can be no doubt about the result"
I would reassure those markets and investors that Britain's economy is fundamentally strong and I would also reassure Britons living in European countries and European citizens living here there will be no immediate changes in your circumstances. I'm very proud and very honoured to have been Prime Minister of this country for six years. I believe we've made great steps, with more people in work than ever before in our history, with reforms to welfare and education, increasing people's life chances, building a bigger and stronger society, keeping our promises to the poorest people in the world and enabling those who love each other to get married whatever their sexuality, but above all restoring Britain's economic strength. And I'm grateful to everyone who's helped to make that happen. It's why we delivered a fair, legal and decisive referendum in Scotland. And it's why I made the pledge to renegotiate Britain's position in the European Union and to hold the referendum on our membership and have carried those things out. This is not a decision I've taken lightly but I do believe it's in the national interest to have a period of stability and then the new leadership required.